Ultra Orthodox Rabbi Ovadia Yosef is the founder and head of Israel's Shas Party, which presently holds a number of seats in the national government. 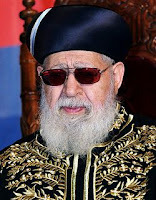 Last week Yosef declared that "religious doctors" should refuse to treat non-Jews if their emergency occurs on the sabbath. During a class on Sabbath halacha relating to religious physicians, the spiritual leader of Shas said that while doctors are expected to do everything in their power – even if it requires violating the Sabbath – in order to save Jews whose lives are in danger, the same does not apply for gentiles. "If a gentile were to get injured in a car accident during Sabbath, and he is brought to the hospital – Israel must not treat him," he said, explaining that "if the particular procedures come from rabbis (de-rabbanan), then they might be permitted, but if they stem from prohibitions in the Torah (de-'oraita), then they are not allowed, as the Torah forbids to violate the Sabbath for gentiles."